With the ever-growing landscape of national, state, and local regulations, industry requirements, and increased security threats, ensuring the protection of an organization’s information is a key part of operating a successful business. Encrypting “data at rest” is a key element when addressing these concerns. Most storage products offer encryption at an additional cost. As with all of its features, the IBM® XIV® Storage System provides data-at-rest encryption at no charge. This gives clients the opportunity to take advantage of encryption and still enjoy the lower total cost of ownership that XIV offers. 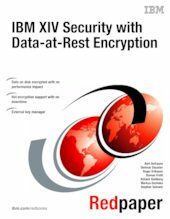 This IBM Redpaper™ publication explains the architecture and design of the XIV encryption solution and how it must be configured and implemented. It can help clients and Storage Administrators who want to enable data encryption on XIV storage systems.